Eversource has been ranked no. 1 in energy efficiency among 30 U.S. investor-owned electric utilities, according to a report by sustainability advocacy group Ceres and the research firm Clean Edge. But there may be room for increased efficiencies, with the growing possibility that New Hampshire state could soon join the five other New England states in setting energy-efficiency resource standards, or EERS, for utilities. “Benchmarking Utility Clean Energy Deployment: 2016” ranks public utilities based on energy-efficiency savings, renewable energy sales and electric market sales using 2014 data. Eversource earned the top spot for incremental annual energy efficiency and life cycle energy efficiency and placed seventh in renewable energy sales as a percentage of electric sales. Among the projects, she said, are partnerships with communities around the state to convert streetlights to LED fixtures. Among them are Manchester, Allenstown, Goffstown, Franklin and Derry and Nashua. In 2014, Eversource’s energy-efficiency programs resulted in an estimated $180.7 million in savings for customers, said Woods. “On the energy-efficiency piece, there’s been a lot of progress and the information analytics have improved dramatically, so there are much better ways for utilities working with other information companies to get more targeted on how they offer their energy-efficiency offerings to customers,” said Bakal. The report already saw an improvement, with five utilities achieving savings of more than 1.5 percent of annual sales, up from just two companies in 2012. In 2014, Eversource saw 1.87 percent in incremental annual energy efficiency savings and 20.20 percent in life cycle energy efficiency, according to the report. The report notes that 13.08 percent of Eversource’s 54 million MWh originates from renewable sources, including Northern Wood Power (a 50-megawatt biomass facility fueled by wood chips in Portsmouth), a 51-kilowatt solar array at the Energy Park facility in Manchester, Silver Lake Solar facility (an eight-acre, 1.8-megawatt solar facility in Pittsfield, Mass. ), a 12-acre solar facility in Springfield, Mass., and another 22-acre solar generation facility in Springfield. It’s government policies that are the strong drivers of clean energy, said Bakal, who pointed to the renewable portfolio standards that set goals for utilities to increase the amount of renewable energy provided to their customers and energy-efficiency resource standards that set energy savings goals for utilities. New Hampshire is the only state in New England to not have energy-efficiency resource standards, or EERS, in place, but that could change soon. 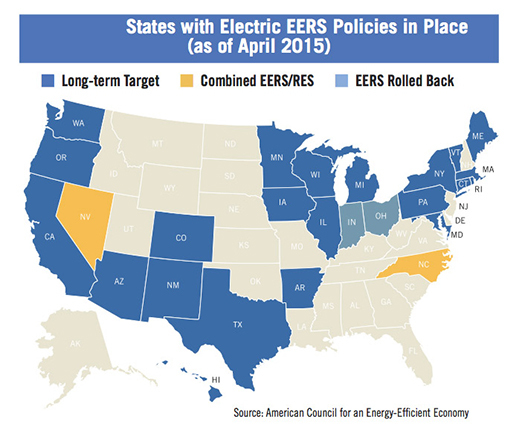 In 2015, the state Public Utilities Commission filed a docket to create the EERS program. In May, the PUC held a hearing in May where all stakeholders presented their settlement agreement. If the PUC decides to move forward, utilities would be required to submit a plan for PUC review and approval to achieve efficiency goals by Jan. 1, 2018, starting with savings targets of 0.8 percent for electric and 0.7 percent for gas. The EERS may have to be run by the state legislature, depending on how the PUC decides to implement the program.